Reading to Know - Book Giveaway Ends ?? MacMillan Audio Young Readers' CD and book combos: The Scrambled States of America and Brown Bear, Brown Bear, What Do You See? Thanks to the generosity of CSN Rugs, our church now has an amazing play rug for the children's area. A while back I mentioned that a representative from CSNRugs.com contacted me and wanted to know if I would like to write a giveaway or review post about their area rug selection. The timing was perfect because our church is currently working to set up an activity area where children can play during bible studies, meetings and other activities. 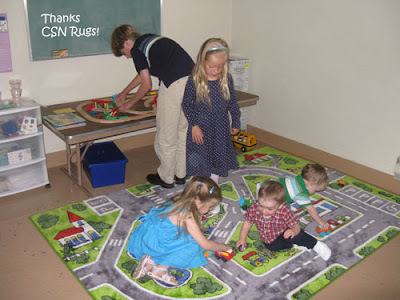 CSN Rugs graciously provided us with a very large city and street play rug for review. Although we still need to purchase chairs and a bookshelf, the activity area looks marvelous so far, as you can see in the above picture. CSN offers a wide range of rugs including many, many kids area rugs. We received a 5'3" x 7'6" L.A Rugs Supreme Streets Rug ($185). While CSNRugs.com no longer offer the supreme version with hand carved pile, a nearly identical rug is available in sizes up to 4'3'' x 6'6'' under the name, Fun Time Around Town Road Rug. 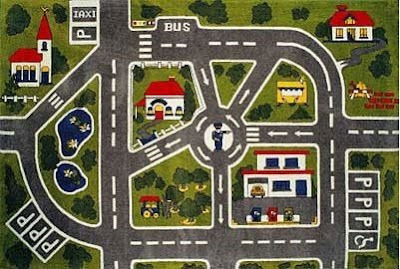 The church on the upper left of the rug looks very similar to our church and the kids have a great time pretending to drive people to services and parking the cars! The rug we received features hand carved pile around the buildings and roads and is very plush and soft to the touch. The roads are wide enough that the kids can use the large, chunky Hasbro plastic cars and multiple children can easily play together on it. Non-skid backing keeps the rug in place. While the price for the supreme rugs seems a bit high, the quality of the rug we received is much higher than those we considered purchasing from the big box stores. The rug shipped quickly after the order was placed and was packaged well, rolled up onto a cardboard tube and covered in heavy duty plastic wrap. I've spent quite a bit of time browsing the CSNRugs.com website and the selection is very, very large. The Joy Carpets line offers several rugs appropriate for educational classrooms, daycare and library use and includes The Faith Based Collection, perfect for religious organizations looking for commercial grade rugs. If you are looking for a supreme style rug like ours with hand carved pile, I recommend you you check out the The Supreme Collection From L.A. Rugs. CSN Rugs strives to offer the very best deal with their 120% Price Match Guarantee. Many thanks to CSN Rugs for the opportunity to review a rug and for providing our church with the play rug. The members at our church truly appreciate it! 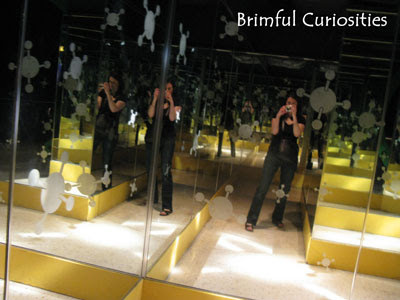 In the Mirror Maze at the Museum of Science and Industry in Chicago. I wish there really would have been multiple "me's" last weekend at the BlogHer conference. Find more of this week's Wordless Wednesday posts at 5 Minutes for Mom or Seven Clown Circus. 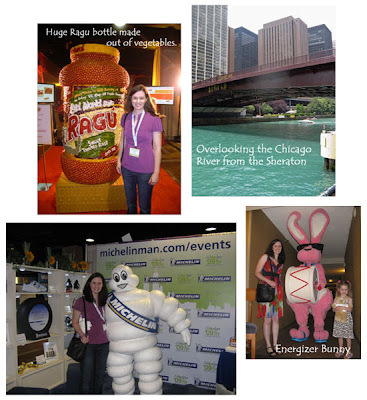 I've tried to condense my experience at BlogHer into a manageable read. Really, it was an quite an experience. I'm not sure I'll attend another conference, but if you are a blogger, attending the World's Biggest Conference for Women Bloggers at least once is certainly worthwhile adventure. My BlogHer trip encompassed more than just the convention. We made our trip to Chicago into a mini family vacation and my husband and daughter accompanied me on the trip. 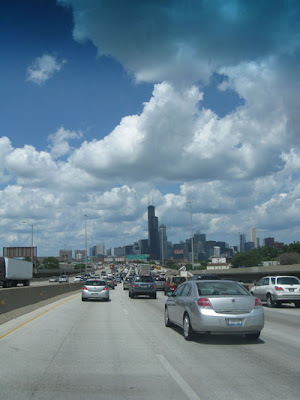 Thursday, Day 1: Our drive to BlogHer went smoothly until we reached the outskirts of Chicago and hit slow traffic. Due to the stand-still, a 15 mile drive into downtown Chicago took 1-1/2 hours. We're still not sure what caused the delay, but later we found out the President Obama arrived at O'Hare sometime that afternoon and the Gold Cup semifinal soccer game was held Soldier Field that evening. When we arrived at the hotel, the first blogger I met Candice of Mom Most Traveled while waiting to check-in. I recognized her immediately, her blog picture is a very true likeness. Since we were late I decided not to attend SocialLuxe and went to the Mom Central party instead. There I had a nice chat with fellow book lover Florinda from The 3 R's. 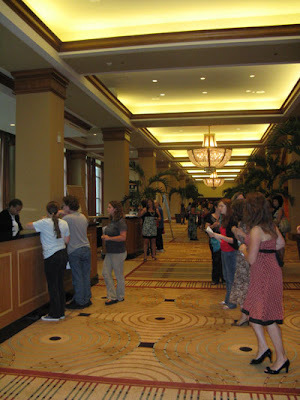 She wrote a lovely recap about the need for BlogHer organizers to work in topics for book bloggers. I agree. For supper, my husband, daughter and I ate at PJ CLARKE's and consumed more than our share of the famous "Minnie®" Cheeseburgers. On our way back from the restaurant we noticed lots of activity at the Hyatt across the street. The President attended a fundraiser there and we were impressed by all the officers involved in security and controlling traffic. 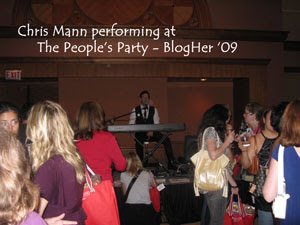 Later in the evening, I swung by the People's Party, listened to Chris Mann and briefly looked in on the Room 704 party and stumbled upon Problem Solvin' Mom. 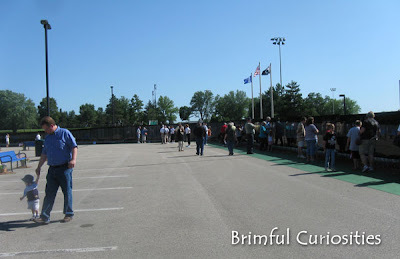 Friday, Day 2: While my husband and daughter went to the Field Museum to see the T. Rex, I met a few bloggers at the Newbie Breakfast and then attended the Welcome and speed-dating session. I wish they would have had a few more BlogHer speed-dating sessions, because I met 10 different bloggers in a matter of 10 minutes! During the break I headed down to the Exhibition area and checked out the many, many sponsor booths. To say that the conference was commercialized is an extreme understatement, but without all those sponsors it wouldn't have been nearly as glitzy. Had my photo taken with the Michelin Man. My favorite freebie finds were the kiwi scoop from Zespri and the book light from PBS parents. The lunch, sponsored by Ragu, featured over the top decorations, but the food was very good. I attended two sessions, Business of You: Brands and Bloggers and Room of Your Own: Blogging Identities and YOU. However, the Community Keynote was most definitely the highlight of the conference. So many heartfelt, amazing stories from real bloggers. After the keynote, I ate supper at the Energizer Suite party, stopped by MomSelect Suite and then headed back to my room to put my dress on for the two evening parties: Type-A-Momfluence (awesome chocolate fountain) and MomPop (equally awesome unicorn cake). The parties allowed me to chit-chat with some other fun bloggers like Sleepy New Mommy. Staying in downtown Chicago rocked and the Sheraton was very nice, although the bed was a little soft. I'm sure we'll take another family vacation to downtown Chicago again. 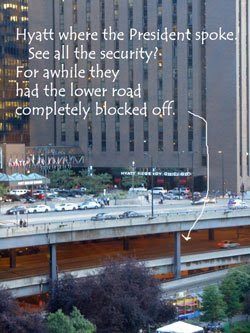 I want to walk around Chicago's Magnificent Mile on Michigan Avenue and spend a little more time sight-seeing. No, I didn't see Tim Gunn or celebrity chef Paula Deen but then again that is not why I registered for the event. I went to meet other bloggers and meet I did. Thanks to BlogHer, I can say that I know other moms all over the U.S and Canada! I chatted with them, laughed with them, and now have some wonderful memories. Wow, I'm still trying to decompress after the few sensational days at BlogHer09. So many bloggers, so little time to try and do everything I wanted to accomplish. But what an experience! 1300+ bloggers not to mention all the PR/sponsor individuals and a few other curious onlookers that wanted in on the fun. Yes, I attended some fairly interesting sessions, popped in on plenty of parties, and walked around feeling slightly overwhelmed by the largeness of it all. I wonder just exactly how much coin was dropped to make it all possible. But I really don't care about most of that. I decided to attend because I wanted to meet other bloggers. And, boy did I get that chance. I had some fun conversations with many bloggers I already knew of including @zrecsmom of http://zrecs.com/ and Average Jane. And I made lots of new connections and friends including Stacey from CreateaBalance.com and the sweet and petite Tara behind When Tara Met Blog. Standing in line for one of the parties I even met a Community Keynote speaker, Danielle (#10), of Knotty Yarn. Her reading of "stuck in the middle with you" had me reaching for the Kleenex not because I was crying but because I was laughing so hard I could barely see through the happy tears. The Community Keynote Lineup was full of wonderful, insightful bloggers sharing some heartbreaking, funny and beautiful moments. Family get-togethers and reunions are a popular summertime activity. We receive an invite to at least one family reunion each summer. The families all mingle together, a crazy-quilt of individuals brought together by relation and catch up on a year's worth of updates. The kids run around and eat the dessert on their plate first. Our reunions always involve potlucks. Sometimes we play outdoor games. Most of the reunions we attend are held in a park shelter building, though once and awhile the reunion takes place at a relative's home. You can bet I won't be volunteering to host anything like that for quite some time though. Too much happy chaos for me! 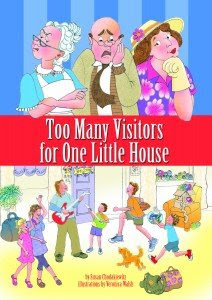 Happy chaos is a good term for what occurs in the children's picture book, Too Many Visitors For One Little House by Susan Chodakiewitz. A family with kids moves into the quiet El Camino Street neighborhood and nosy neighbors keep watch for signs of trouble. Nothing out of the ordinary happens until the day a huge camper pulls up in front of the house and a whole bunch of people spill out and head into the house. Not fond of any sort of noisy ruckus, the nosy neighbors get ready to report the disturbance to the city complaint department, all the while proclaiming "Too many visitors for one little house!" Susan Chodakiewitz's debut and self published picture book includes everything you'd expect to find during a high-spirited family gathering involving kids and parents, aunts, uncles, cousins, grandparents and even a scraggly, stray dog. The really interesting thing about this book is that some of the events depicted actually occurred. One summer after moving to a new home, author Susan Chodakiewitz did have numerous, rather boisterous family members all stay at her home and her neighbors reported the "suspicious activity." The book contains a lot of stereotypes, and Walsh's slightly caricature-like illustrations help bring out the exaggerations. Readers see a fashion-crazed teen, grandma carrying prune juice bottles, grandpa lugging a plunger and toilet paper and a nanny in a wheel-chair with her fresh apple strudel. While it is obvious to adults that the characters are meant to be a bit outrageous, I took the time to point out some the stereotypes to my daughter. (I'm not bringing up the topic of prune juice though...some things are better left unsaid to preschoolers.) My daughter liked the lively pictures and the repetition of the phrase "Too many visitors for one little house," but her very favorite part of the book was the addition of the scraggly dog. The main message of the book deals with friendship and is a good one to learn...a message of inclusion rather than exclusion. Chodakiewitz also developed a musical version of the book. You can visit her website Booksicals to learn more about how the characters are brought to life using acting, song and dance. She is planning a sequel to the book featuring the scraggly dog. Readers can help name the dog by entering the Booksicals "Name the Dog Contest." It was a good year for wild Black Raspberries (a.k.a Black caps). My husband and dad picked a whole bunch of them last week at my grandparent's farm. I made a pie and a Lemon Blackberry Clafoutis and then froze the rest. 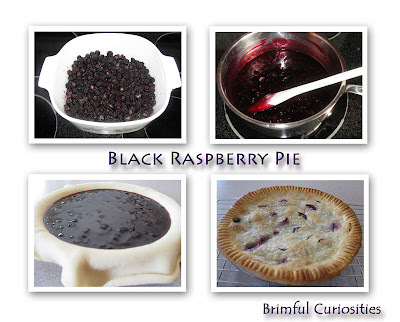 Nothing better than warm Black Raspberry pie served with a scoop of vanilla ice cream. One thing I'm going to need this week is a lot of energy. We'll be busy, busy, busy! My grandfather turns 90 (amazing energy! ), my nephew turns 1 (another big milestone!) and we're driving to Chicago for BlogHer and also plan to visit Museum of Science and Industry and The Field Museum. And my digital camera will accompany me to all those events. Thanks to Energizer and that pink bunny, at least my camera won't lack in energy even though I may be dragging! Around here it seems just about every little gadget and toy needs batteries! Energizer knows all about energy and energy needs. 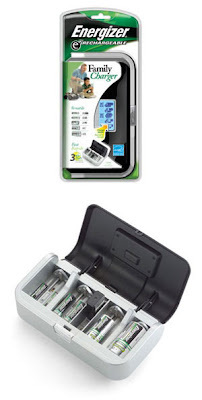 Their line of rechargeable batteries and charging systems caters to on the go families. I just briefly walked around our den and counted no less than 10 battery powered toys on the floor. That is the tip of the iceberg. We go through quite a few batteries, needless to say. Here are the top battery hogs in our home: our flashlights, the digital camera, my daughter's LeapFrog Tag reader, my son's Fisher-Price Ocean Wonders Aquarium, the kid's electronic music keyboard and the Brio battery-powered train engine. They all require different battery sizes. Energizer recently sent me a variety of chargers and batteries to review. The first one we tried out is the Family Charger. Geez, I should of had one of these chargers a long time ago. It charges all sizes in multiple combinations, up to 8 AAA, 8 AA, 2 9V, 4 C and 4 D. The charge status indicator lets you know when charging is completed. We use AA batteries the most, so the ability to charge 8 at a time is certainly useful. While we've only had the charger and batteries a month and can't verify all the claims as far as durability and how long the batteries keep charge in storage (manufacturer claims up to 6 months), what we can attest to is that the rechargeable batteries work as good if not better than the ordinary alkaline AA batteries. Plus, the charger is good for the environment. I'm so happy I don't have to dispose of as many batteries as before. The Energizer Family Charger suggested retail price is $29.99 (batteries not included). The charger is best suited for Energzier NiMH batteries. Charge time varies depending on the battery size and how many batteries need charging. It takes about three hours to charge 4 AA batteries and six hours to charge 8 AA batteries. (Refer to Energizer website for complete instructions and product details.) I know that fast chargers are all the rage, but here's one interesting tidbit I learned by visiting the website FAQ page: "fast chargers can limit the NiMH battery lifetime to 150 charges while slower chargers can prolong the cycle life to more than 500 charges." Did you know you can recycle your rechargeable batteries free of charge? Visit http://www.call2recycle.org/ for full details and to find a recycling center near you. Buying a charger? 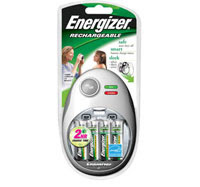 - Don't forget to send in the Energizer® Rechargeable® Charger $5.00 mail-in Rebate. Offer ends 8/15/2009. Win a charger! Do you go through a ton of AA/AAA batteries like us? Energizer provided me with an Easy Charger with auto shut-off (smaller than the Family Charger, but includes AA batteries) to giveaway to one Brimful Curiosities reader! To enter, leave a comment letting me know what device or gadget you'd like to power with rechargeable batteries. • Contest ends on Monday, August 3rd, 2009 at 11:59 PM CST. The first time I heard about Kraft Bagel-fuls was not from any advertisement or PR campaign but from a good friend. She recommended them to all the moms in our weekly playgroup. Her words, "Some mornings by the time I get myself and the kids dressed and ready to go out the door, I hardly have time to eat. I like to eat Bagel-fuls for breakfast on mornings when I otherwise wouldn't have the time to make myself anything. Plus they are super delish!" 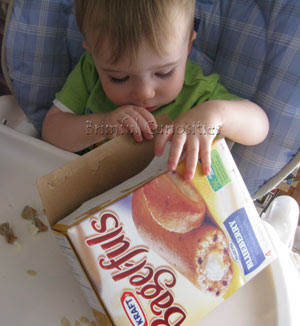 If you want to give Bagel-fuls a try, you can print out a $1 Kraft Bagel-fuls coupon from the Kraft website. See top right hand corner. A Parent in Silver Spring Reviews - Book Giveaway Ends 7/22/09 ?? Word-Vessel - Book Giveaway Ends ?? My preschool daughter is at the perfect age to completely appreciate and enjoy the Ni Hao, Kai-lan animated series. We've watched quite a few episodes on Nick Jr. since the show first aired last year. The series features a five-year-old Chinese-American girl named Kai-lan and introduces preschoolers to Mandarin language and Chinese culture. Much like the Dora series, Kai-lan goes on small adventures with her animal friends, learns valuable lessons along the way and encourages viewer interaction. Kai-lan depends upon her grandfather, Yeye, for guidance and support. Kailan's animal friends include: Rintoo, the tiger; Tolee, the koala; Hoho, the monkey; and Lulu, a pink rhino. Besides the bilingual aspect, the show also teaches kindness, compassion, and how to deal with feelings and emotions. One of the standard messages is "Try it! Because you might like it!" My daughter has amazingly picked up a number of phrases including "Ni Hao," the term for hello (also the show's title) and thank you, "xie xie." Kai-lan's large eyes and catchy songs appeal to preschoolers and the background graphics are bright, colorful and slightly abstract like a fun children's video game. A new Kai-lan DVD released on July 14th called Ni Hao Kai-Lan: Kai-Lan's Great Trip to China . 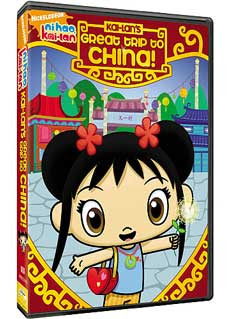 The DVD runs 96 minutes and includes three separate episodes: a double-length feature episode Kai-Lan's Trip to China, and two additional episodes Rain Or Shine and The Ant Playground. We had the chance to preview the DVD before it released, much to the delight of my daughter. She has watched it a few times and really, really likes the trip to China segment. Kai-lan's aunt, Gu Nai Nai, invites Kai-lan and her friends to China to learn more about the Chinese culture. During their visit, they meet a baby panda that likes to eat watermelon. (Preschoolers love baby pandas ... at least mine does because the baby panda was a huge hit here.) In the other segments Kai-lan has fun in the rain and helps build a swing for some ants. My only complaints: I'm not sure what to make of Mr. Sun's sun fuzzies. They are just strange. The special features section only includes one feature, a music video "We're Going to China." I do wish that the DVD included a term and pronunciation guide in the special features so that it could be used more effectively as a teaching tool. Overall though, we really enjoyed the DVD. I must say that I'm really impressed with the Nick Jr. website. It has some excellent corresponding Kai-lan activities, games and printables. Many of them are specifically related to the Great Trip to China DVD. 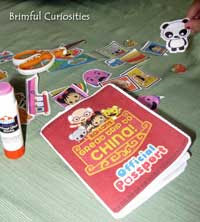 My daughter enjoyed making her own Great Trip to China Passport. She's modeling it in the picture to the right. Win a copy. Nickelodeon has kindly offered to giveaway a Ni Hao, Kai-lan: Kai-lan's Great Trip to China DVD to (2) Brimful Curiosities readers. 2 WINNERS! To enter, leave a comment relevant to this post. Thanks to Nickelodeon and Bender/Helper impact for the review opportunity. Some great giveaways here the past few weeks. Here are the winners! Click on the random.org images to see them full size. As always, the recipients were chosen using random.org and have been contacted by email. They have 72 hours to get back to me before another winner is chosen. The winners are Carlene (comment #55) and Kristina (comment #58). The winner is Katrina V (comment #8). Mishia (comment #82), Shawna (comment #103), Michele Vogel (comment #69). The winner is Lori (comment #104). 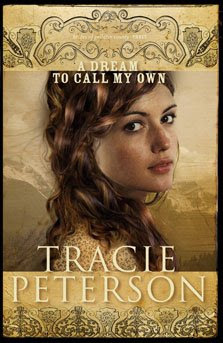 A Dream to Call My Own, the 3rd book in Tracie Peterson's Brides of Gallatin County trilogy, tells the story of the stubborn, unpredictable Lacy Gallatin. She's the youngest of the three Gallatin sisters. Together they run the Gallatin House, a roadhouse where they board and feed the stage coach passengers traveling through the Montana frontier in the 1880's. Both Lacy's sisters are married but Lacy is terrified of getting hitched, afraid that she would fail at being a wife. She's convinced herself that she's failed everyone close to her, especially her mother and father. She has made it her personal mission to discover her father's killer and find her revenge. Lacy is especially hard on the deputy sheriff Dave Shepard, accusing him of not spending enough time working on her father's unsolved case. Despite her attitude toward him, Dave finds himself falling in love with Lacy. When they become trapped alone together during a blizzard, sparks fly (not all romantic.) To top it off, all is not rosy in the Gallatin part of the Montana frontier. When a lowlife by the name of Jefferson Mulholland comes into town and joins forces with local saloon owner Rafe Reynolds, the Gallatin sisters wonder if they would be better off selling their property to escape the dangers in town. Lots of decisions and some suspenseful moments pull the sisters together while, through it all, Dave and Lacy try to make sense of their feelings for each other. I liked A Dream to Call My Own the best out of all three books in the series. Lacy, my favorite character, is easy to like with her wild ways. I found the romantic tension between Lacy and Dave amusing and heartwarming. Failure, fear and the feeling of inadequacy are common themes in the book. Peterson, an excellent Christian historical fiction author, uses scripture passages and messages through her characters to spread God's word and remind us of His constant presence in our lives. A visit to The Moving Wall, a half-size replica of the Washington, D.C. Vietnam Veterans Memorial. It has been traveling the country since 1984. 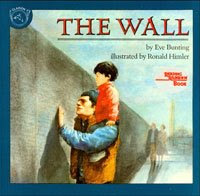 Before we went, we read Eve Bunting's picture book titled The Wall. 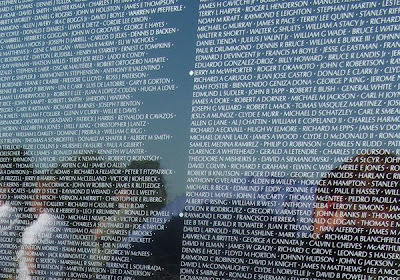 In the book, a little boy and his father visit the Vietnam Veterans Memorial in Washington, D.C. and look for the name of the boy's grandfather on the wall. A Very Purple Pepper: Colors to Know So You Can Grow? I didn't know Stonyfield Farm products existed until I after my daughter was born. I saw their YoBaby yogurt in the store while searching for some beginner foods for my infant girl and brought some home. We've been hooked on Stonyfield Farm ever since. Their yogurt products are so exceptional I hardly ever buy another brand. Here's why: they produce organic yogurt that tastes delicious. There's no additives, preservatives, growth hormones or any other undesirable ingredients. My one-year-old son loves eating YoBaby yogurt, and I'm happy that I'm able to provide him with this healthy food choice. I buy the 32oz Lowfat container (usually vanilla flavor) for the rest of the family. This year YoBaby turned 10 years old and the company made a few packaging and formulation changes. The yogurt now contains two additional essential nutrients: Zinc and Vitamin D, to helps develop and support brain function, immunity and growth. And as you can see from the above picture, the packaging is brighter, more eco-friendly and is now bilingual with the addition of some Spanish words. You can see the difference in this YoBaby comparison of old and new looks. My son tried out the new, improved YoBaby. He gobbled it right up so it obviously earns his seal of approval. He really, really likes the blueberry flavor. 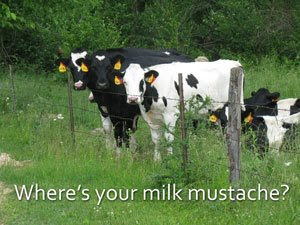 The Stonyfield Farm website provides a wealth of information. You can sign up for coupons, learn about the products, read the Baby Babble and Bovine Bugle Blogs, learn about their earth-friendly actions and find great recipes. 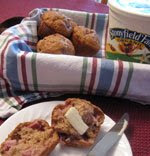 Just recently I made the Strawberry muffins...excellent! I took a picture for you to see how good they turned out. Facebook users: become a Stonyfield Farm facebook fan. They're giving away some great prizes every day. Want to try YoBaby products for yourself? 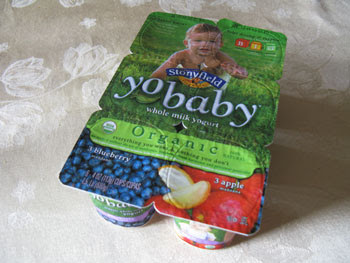 Print off a coupon for $1 off YoBaby. 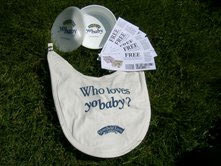 In celebration of the new YoBaby look, Stonyfield Farm has kindly offered to give away a YoBaby Prize Package that includes a YoBaby bowl with lid, an organic YoBaby bib, and a bundle of 5 Free YoBaby coupons to one Brimful Curiosities reader. To enter, visit Stonyfield Farm and let me know which YoBaby product is your favorite or tell me how you first learned about YoBaby products. • Contest ends on Monday, July 20th, 2009 at 11:59 PM CST.